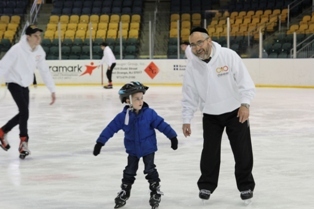 WEST ORANGE, NJ — Smiles and laughter permeated the Richard J. Codey Ice Skating Arena at South Mountain as more than 500 children, teenagers and parents participated in the Chai4ever Chol Hamoed outing on Monday, April 6. From novice to experienced skaters, everyone enjoyed partaking in one last winter pastime, with the knowledge that spring is finally here. That was just the beginning of full-day of activities, which continued just a small “jump” away at the nearby Sky Zone Trampoline Park with every imaginable bouncing activity. This included springing in foam pits and on trampolines, trampoline dodgeball and volleyball, and skyslam basketball dunking. The enthusiasm and high energy levels carried through to the evening concert by Eli Marcus and the Rak Rega band. 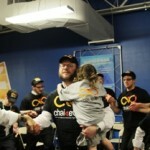 The spirited dancing and singing bought everyone’s simcha to another level. Watching seriously ill parents dancing with reckless abandon holding their kids close, brought everyone to their feet. Even the most exhausted youngsters had huge smiles on their faces as they left the indoor park late that evening. 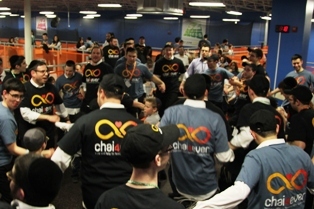 The Chol Hamoed celebration was the culmination of the full spectrum of programs offered by Chai4ever to address unique and not so unique Pesach needs in families struggling to cope with a parent’s serious illness. 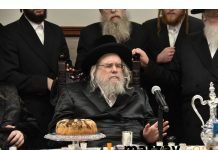 Other services included providing cleaning help, financial assistance, kosher l’pesach meal deliveries, afikomen toy distributions, and respite retreats to Pesach programs in hotels for all or part of the holiday. 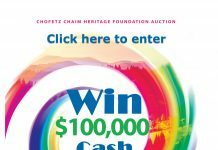 Since its formation in February 2014, Chai4ever has quickly become the premier address for families in the US and Israel undergoing the crisis of a parent with such catastrophic illnesses as cancer, heart and lung disease, and stroke victims. With the mission of providing emotional and practical support to mitigate long-term damage to the family, Chai4ever’s comprehensive year-round services include housekeeping assistance, homework help, crisis and bereavement counseling, transportation, Big Brothers/Big Sisters, meal preparation and delivery, insurance advocacy and navigation, family retreats and recreational events, and collaboration with schools and hospitals. For more information on Chai4ever, visit www.chai4ever.org, e-mail info@chai4ever.org or call (646) 519-2190. Wow! This is so inspiring keep up with your great work bringing these families joy again!